Cuisinart is a reputable brand that has made a name for making quality kitchen appliances. They are known for durability and their latest appliance, Cuisinart CPT-180 4-Slice Toaster will deliver as per the expectation from the Cuisinart name. The sleek, stainless steel housing with refined chrome give this toaster a shiny finish that will match any décor of a modern kitchen. Not only does this toaster enhance the appearance of your kitchen with its looks, but it also delivers perfectly when it comes performance. One of the outstanding things about this toaster is that it comes with custom controls that allow one to defrost pastries, waffles, bagels, and bread for toast. 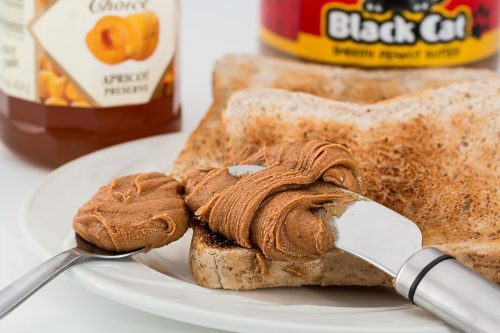 You can toast four slices at a go, so it is quicker and convenient. The dual control panels ensure everyone has their toast as per their desires. It Has Dual Control Panel – This feature enables you to make two slices of toast each with a different setting. You can toast bread and an English muffin at the same time using separate controls. This helps saves time and ensure everyone has their toast the way they desire. It Has Easy To Use Controls – This unit is easy to use even without a user manual; but there is a comprehensive, easy-to-read user manual included. 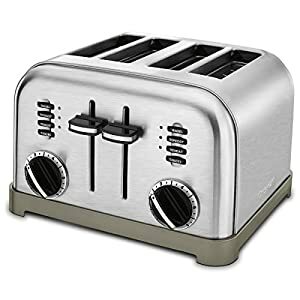 It works like any other toaster; you just place your bread or food in the slots and then push the handles down. When cooked, the bread pops up, and in case it gets stuck, you simply use a level to eject it instead of using your fingers. Removable Crumb Tray – Getting crumbs and dried out foods out of a toaster can be a challenging task and therefore, by Cuisinart CPT-180 4-Slice Toaster having a slide-out crumb tray makes it highly convenient. Keeping your toaster clean and clear of crumbs ensures safety since crumbs can catch fire. Empty the crumb tray frequently to keep your house and family safe. Warranty and Support – This appliance comes with a 3-year warranty, and they have an excellent customer support that is always willing to help. High-lift Carriage – Many toasters pop up too low which forces one to reach down to pull the bread out. This can result in the burning of fingers as small pieces of bread such as English muffins get stuck. However, the carriage on this unit lifts the bread high, so you will not need to reach down to pull out your bread. It is highly durable– Cuisinart CPT-180 4-Slice Toaster is made from stainless steel, which enables it to withstand knocks from counter and walls. It might have slight scratches, but it would not break. Variety of Toasting Options– this unit allows one to personalize their toast. The browning dial gives you an option to choose your desired toast shade. You can also defrost and reheat, so food like waffles, homemade bread, and pancakes can be frozen, toasted, and then reheated later. Ease of Cleaning– this model comes with a slide-out crumb tray that makes cleaning it easier. Besides, it has an easy and convenient cord storage. It is also BPA free. Wide Toast Slots– with slots width of 1.5 inches, this unit can accommodate thicker slices of bread. You don’t need to trim your slices of bread or only toast certain foods. Modern Design– this toaster is made from sleek, brushed stainless steel which enhances any kitchen décor by adding a modern appeal. It’s has a decorative design as well. To clean it, simply use a paper towel to wipe its surface. It’s Quite Pricier– being a recognized brand, Cuisinart has pricier appliances, and CPT 180 is slightly costlier than most of its competitors. However, it packs a lot of valuable features which makes it worth its price. Besides, it is highly durable and therefore will give you great service for many years. Slow Toasting– this unit can take time to toast thick slices of bread. If you are short of time, toast thinner pieces of bread. Although this is not a significant compromise, it is something you need to be aware of. This affordable toaster from Cuisinart is one of the best toasters you can buy. With a classic retro design that makes it timeless, Cuisinart CPT-180 4-Slice Toaster is a perfect unit for a family that needs to toast their foods in the morning. It is durable and a great model for any toasting need.